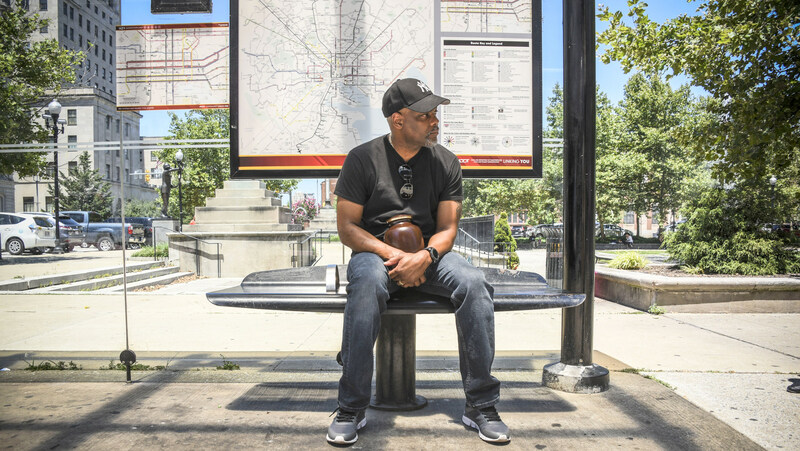 For office workers in downtown Baltimore, Lawrence Alexander was a familiar figure, greeting early arrivers with a cheerful wave from the bus bench where he typically slept. 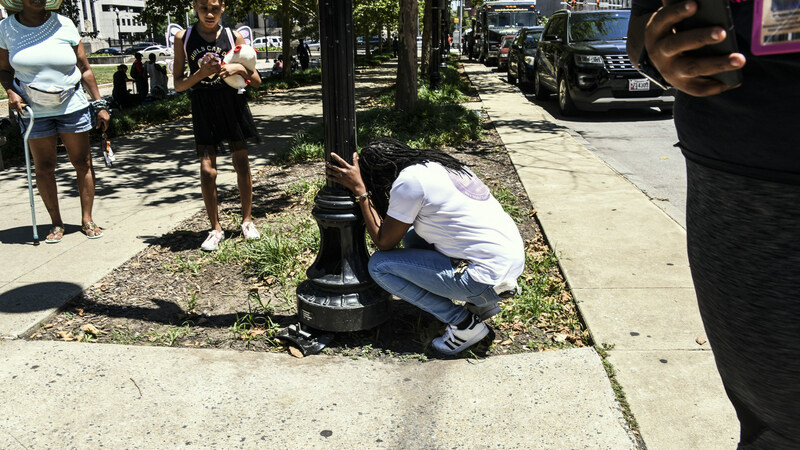 For Mayor Catherine Pugh, Alexander was, among other things, a political problem when he was found dead beside the bench in front of City Hall, just days after she was sworn in on December 6, 2016. For his far-flung family, though, “Lawrence” was still alive in their hearts and minds. He remained the headstrong and mischievous brother who joined in on ambushing their mom with snowballs when she returned to their home in the Bronx, New York, from her job as a Bristol-Myers Squibb mail clerk. 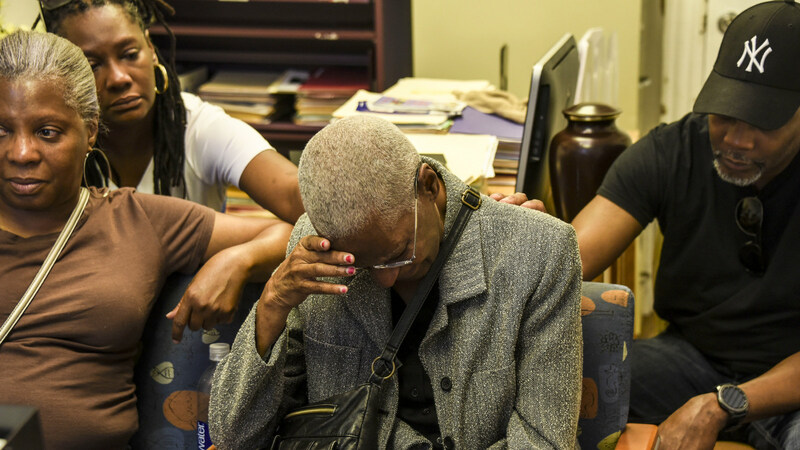 In May, the family found out what people in Baltimore have known for a year-and-a-half – Lawrence had died on the ground on a cold night in Baltimore. 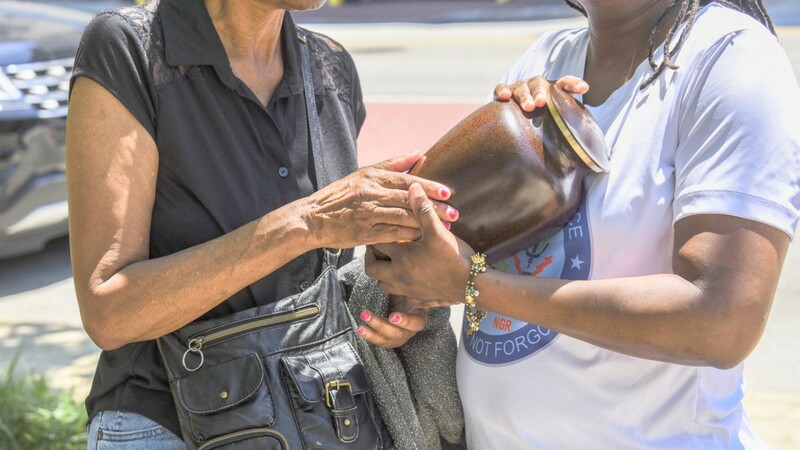 On Monday his sisters, brother and mother came from North Carolina and Georgia to receive the urn containing Lawrence’s ashes. They were overcome with a cascade of emotions. Grief to have lost him. Joy to have at last “found” him. And anger that no one in city government had tracked them down to let them know their loved one had passed. “We are not that hard to find. 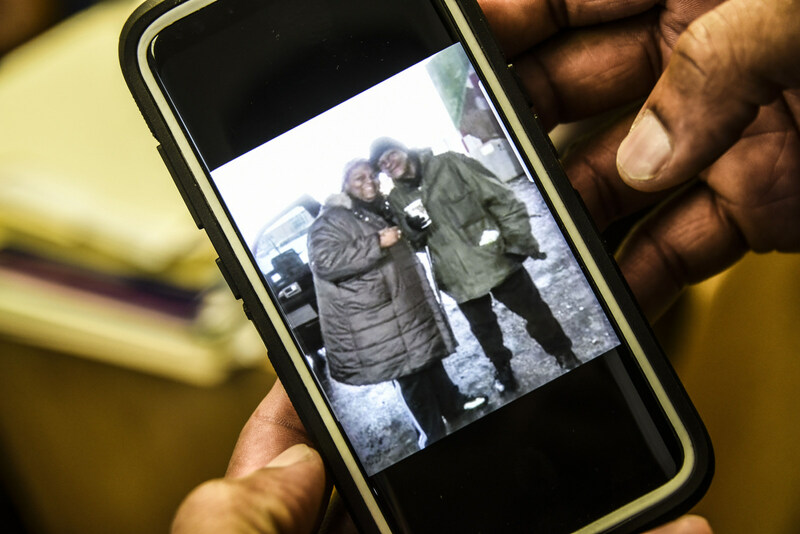 It’s like they didn’t even try,” said Faith Alexander, in the office of homeless advocate Christina Flowers, who had provided housing for Lawrence and knew him. “Just because people are homeless, doesn’t mean somebody doesn’t care for them,” said Lawrence’s mother Teresa Singleton, sobbing. Holding back her own tears, Faith reached over to comfort her. Daniel, who had kept his hand resting firmly on the urn, moved it to his mother’s shoulder, holding it there as she wept. The story of how Alexander’s ashes came to be sitting in the window of Belvedere Assisted Living on Charles Street centers on the person who heads it, Flowers, who has survived controversy to remain a persistent presence on city streets where she offers homeless people housing. Flowers alerted the media the day she learned of the 54-year-old’s death. Worried no one would ever be located to claim his remains, she contacted the medical examiner’s office in order to do so herself. Officials there eventually gave in, and Flowers, with help from several good Samaritans, saw Alexander’s remains transferred to the Joseph H. Brown Jr. Funeral Home in Penn-North. Two days after viewing his body at the funeral home, Flowers said, she was given his ashes (“All I had to pay for was the urn”) and organized a service for him at Baltimore’s St. Vincent De Paul Church. People who knew him, homeless activists and even a member of the Police Department’s Homeless Outreach Team attended. Others familiar with Alexander held a separate service for him at Mt. Zion Lutheran Church on the other side of the plaza. How did Lawrence’s family lose touch with him? His siblings describe a happy childhood that started in southern Maryland but ultimately was spent in New York City. They recall being taken to the park and the ice skating rink near Yankee Stadium and, for vacation, going to Bear Mountain outside the city. “We would dress up and put on shows,” Vanda Alexander recalled, cracking up. “We would put on wigs and everything,” Daniel recalled, chuckling, too. Lawrence encountered an unusual challenge that set him apart from his siblings. As a toddler, he had an ear infection that went untreated during a time when his mother underwent a lengthy hospitalization and he was in the care of others. But Lawrence was able to make himself understood and to understand others. The siblings recalled other things about their brother. He was good at art and great at fixing cars. He worked for Goodwill Industries at one point. 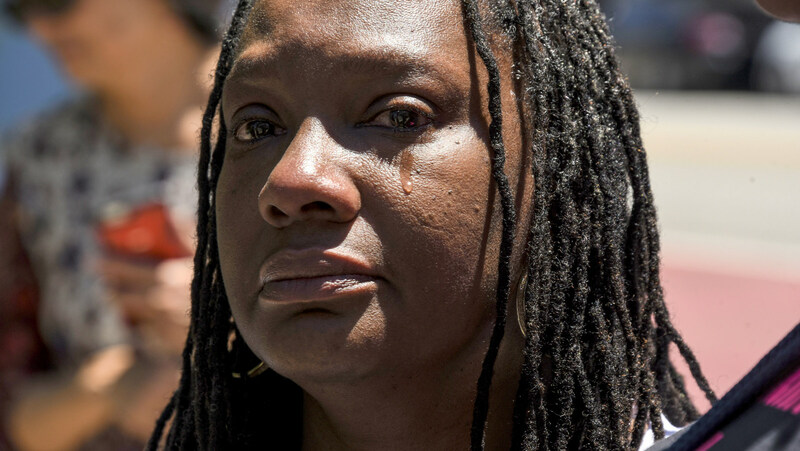 About 15 years ago, after Lawrence and his mother had returned to Maryland, the apartment building where they lived was slated for an upgrade and they and other tenants were evicted. Their mother found a different place for him to live in southern Maryland, but Lawrence didn’t want to go. As a toddler, Lawrence had an ear infection that went untreated during a time when his mother underwent a lengthy hospitalization and he was in the care of others. It left him deaf. “He started running with the wrong crowd and messing with drugs and stuff,” Daniel said. After that, the family’s contact with Lawrence was sporadic. Vanda said she would periodically check the city jail in the hope that they would at least give her a fixed address. Faith, who lived in Baltimore for a time, would keep an eye out for him on city streets. Daniel replayed in his mind the one phone conversation he had with Lawrence. Finally, they got someone to do a thorough Internet search that turned up past addresses in Baltimore, which led them to Flowers. “I asked her if she knew how we could reach our brother, and there was dead silence,” Faith said. Maybe what Flowers told them was wrong, maybe it was someone else, she told herself, until she saw a photo and knew it was true. Receiving the ashes was only one part of the family’s mission Monday. They were determined to see the place where Lawrence spent his last moments. Accompanied by 10-year-old Jordan Bye, Lawrence’s grand-niece, they stepped onto the busy sidewalk under a blasting midday sun. Faith knelt and rested her head on the utility pole her brother’s might have touched. Daniel sat quietly on the bus bench, holding the heavy mottled-brown urn. Meanwhile Vanda – taking in the several dozen people sitting or dozing on War Memorial Plaza, people like Lawrence – kicked into action. “Where can I buy some bottled water?” she asked, explaining that she wanted a 24-pack so she could hand out bottles to people who were thirsty. At one point, she contemplated driving miles to a discount store she found online. Three city workers on lunch break came to their aid. They had just bought that size pack, they said, offering to give it to them and refusing to take any payment. “I couldn’t believe it,” Vanda said. Moments after that, one of the homeless people on the plaza, Robin Serrett, sat in the shade with Lawrence’s mother and told her that police consider people like him “an eyesore” and roust them from their sleeping places. What did they think of the misery, and the moments of mercy, on display all around them? “I’m just overwhelmed right now,” Faith said, looking at her siblings handing out the water while some people approached the officers for pizza and others lay quietly on blankets on the stone ledges. “I do know I feel Lawrence’s presence here,” she said. What the family saw driving around Baltimore shocked them, family members agreed. Faith was asked why they agreed to talk to a reporter about her brother’s life and death. She answered readily. “I want change, not just here but everywhere. Something’s got to change,” she said. The work of photojournalist Joe Giordano has appeared in The Wall Street Journal, The Guardian, The Washington Post, Baltimore City Paper, Discovery Channel, Inc., Rolling Stone and many other publications.